Like my beloved Ysabeau S. Wilce, Jasper Fforde has a gift: his endlessly inventive books feel coherent, even when his actual plots are totally nuts. 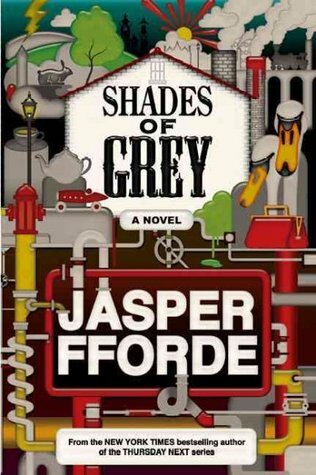 Shades of Grey, the first book in Fforde's third series, is set in a post-apocalyptic world in which humans can only perceive a single color. Social caste is determined by the type and strength of one's color perception, with everybody lording it over the unfortunate Greys. Eddie Russett, a young man with unusually high Red perception, has questioned the rigidly-enforced status quo once too often. He is in the running to marry a fickle young woman from an upper-class family, but first he needs to finish his punishment: a trip to the remote village of East Carmine to conduct an utterly pointless chair census. Eddie is very aware of the consequences of curiosity, but there's something about East Carmine—and Jane, a fierce Grey girl with an adorable nose—that inspires inquisitive thoughts. No matter how outlandish his premise, elaborate his world-building, or obscure his in-jokes, Fforde never loses sight of his obligation to entertain. Unfortunately, his style of writing obviously takes loads of time, effort, and research, which brings me to Shades of Grey's fundamental flaw: this book came out in 2009, the prequel isn't coming out until 2016, and I have no idea when (if ever) Fforde will pick up the main plot again. Shades of Grey is a delight, but readers who prefer their series installments to be released on a reasonable schedule would be well-advised to look for an author who doesn't work so hard and so long at being dazzlingly clever.